Is it even possible to keep track of CNN’s blunders anymore? 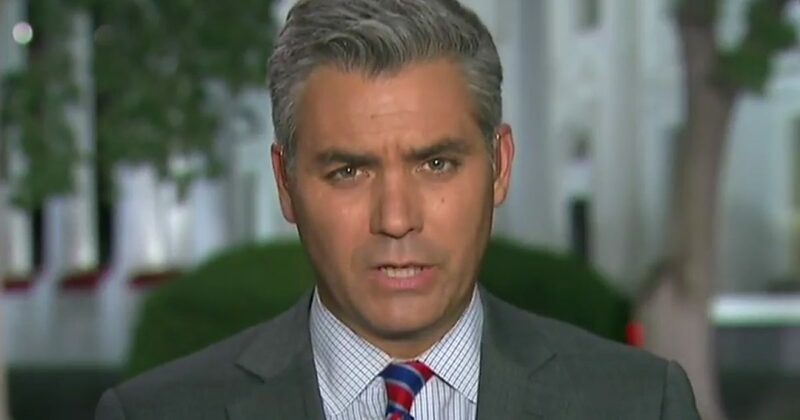 Jim Acosta might as well be a paid promoter for the Democratic Party. He’s not looking for the real story or the facts. Instead he’s looks to sell a narrative that Trump is bad and Democrats are right in all circumstances. However, what he’s peddling isn’t exactly the truth. Saturday, Acosta thought he had a ringer. He asked White House Legislative Affairs Director Marc Short about his opinion of the government shutdown on Trump’s one-year anniversary as president. Short handled the question with grace and factual knowledge. Now, poor little Jim wishes he could crawl under a rock. It’s reflection of the Democratic Party. They’ve pushed their leadership to say we want something to shut down the government. They look back and see the largest tax cut in history. They see the repeal of the individual mandate…at the regulatory rollback…what’s happened with $7 trillion added to the stock markets and see more circuit court judges ever confirmed in one year and a new supreme court justice confirmed. Acosta had nothing more to say. Facts are indeed stubborn things. Democrats can try to blame this shut-down on Republicans. However, few would dare dispute the cold, hard facts. Republicans did their best to keep the government running. In both the Congress and the Senate, Democrats voted overwhelmingly to close the government. Of course President Trump would be another Yes. Therefore, it’s baffling to think people actually blame Republicans for this mess. This isn’t the first time Jim Acosta tried to blame the GOP for this shutdown. Previously, Mick Mulvaney sparred with Acosta. Again, Acosta didn’t fare well. Jim Acosta: At the comments beginning this you said it was the Schumer shutdown. How could it be the Schumer Shutdown when Republicans control the White House, the House and the Senate? Mick Mulvaney: Come on. You know the answer to that as well as anybody. I have to laugh when people say that. ‘Oh we control the House, the Senate, the White House, why can’t you get this done?’ You know as well as anybody that it takes 60 votes in the Senate to pass an appropriations bill. Right? You know that? Jim Acosta: I know that. Mick Mulvaney: So when you only have 51 votes in the senate you have to have Democrat support in order to keep the government to fund the government. So that’s the answer to your question. Democrats bet on the idea that Republican control of the government implies they are at fault. Few buy this nonsense. A new POLITICO/Morning Consult poll, conducted Thursday and Friday also found more voters would blame Republicans in Congress for the government shutdown (41 percent) than would blame Democrats (36 percent). Democratic and Republican voters, by wide margins, held the other side responsible. But more independents said they would blame Republicans (34 percent), than Democrats (27 percent). Yet, the shutdown is no clean political win for Democrats. Americans don’t necessarily approve of the party’s strategy to insist on a legislative solution for undocumented immigrants brought here as children before voting to reopen the government. In fact, both parties’ immigration stances — Democrats’ efforts to protect the so-called Dreamers and Trump’s insistence on funding a border wall with Mexico — are viewed by voters as less important than keeping the government open. So 41 percent would blame Democrats, 36 percent would blame Republicans. But it’s the independents who supposedly hold Republicans responsible? I don’t believe it. And neither does Politico or any other Leftist. Politico admits this when they wrote, “no clean political win for Democrats”. Americans want their political parties fighting for citizens, not “Dreamers”. A recent focus group from CBS verified this as well. This focus group doesn’t bode well for the Democratic Party. They can fool themselves with fake news polls, but this is a clear warning.